100% Original IJOY Avenger Sub Ohm Tank Waiting For You! 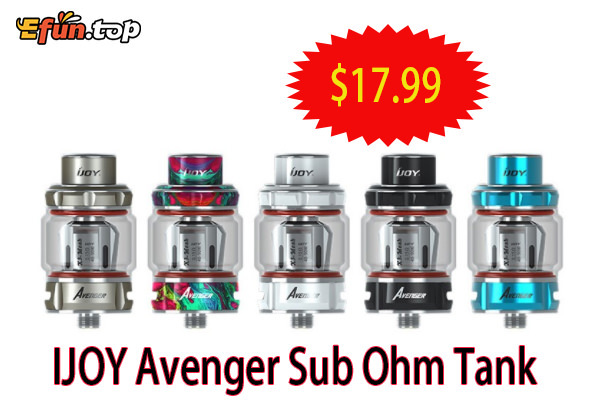 Here comes the newest IJOY Avenger Sub Ohm Tank! 100% original only 17.99$ 24hr ship! Avenger is a brand new vape sub ohm tank which comes with new mesh pre-made coil to enlarge the heating area for large vapors and great flavors, making Avenger Tank like a RDA. Also, IJOY Avenger Tank has a compact size and comfortable feeling in hand, and it can compatible with the X3 coils. With top filling system and large buttom aiflow system, it can create awesome flavors.